For over two years, a small group of determined people has been planning to establish a community garden in Old Ottawa South. They envisioned a garden that would include growing space for individuals, families, and the community; a children's garden; and a space to grow food that would be given to those in need. All the gardening practices would be organic, with no chemical fertilizers or pesticides. The search for an enduring site. . .
After an exhaustive search, many discarded potential sites, and much public consultation, the perfect spot was finally located in Brewer Park, in a sunny, out of the way corner between Brewer Swimming Pool and Westboro School. By this time, the group had grown to more than 25 coordinating members! 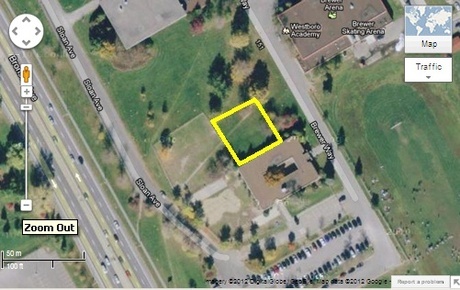 On May 22, 2012, the City of Ottawa approved the site, and the Brewer Park Community Garden was born. With funding from the City of Ottawa, Just Food/Community Garden Network, TD Friends of the Environment Foundation (for the children's garden), Capital Ward city Councillor David Chernushenko, as well as support from EcoAce Reconstruction, the building of the community garden began. Brewer Park Community Garden has been in operation since summer of 2012 that saw the construction of 28 raised beds and the involvement of dozens of dedicated volunteers to establish a community garden in Brewer Park with the support of the TD Friends of the Environment Foundation, the Community Garden Network through Just Food Ottawa, the Office of Capital Ward Councillor David Chernushenko, the Environment Committee of Ottawa South (ECOS), Westboro Academy and the City of Ottawa. Thanks to funding in 2013 from the Ontario Trillium Foundation, Just Food Ottawa and the Government of Canada's Summer Jobs Program, BPCG has been able to build up to 35 more garden boxes, 9 berry boxes, 4 communal boxes and a shed. These garden boxes, which are used for personal plots, the children’s garden and communal plots, has more than doubled the size of the garden and has completed the growth the garden, as originally planned. In the spring of 2014, site excavation began on BPCG's Biodome Garden with construction taking place over the summer months. And on August 17, 2014, City of Ottawa Mayor Jim Watson officially opened the completed biodome structure. The Biodome Garden, a pilot project, is the first of it’s kind in Ottawa. Like a greenhouse, the biodome will give BPCG members an extended growing season, as well as serve as a demonstration, education and research station, for gardeners, community members, and local schools. In most neighbourhoods of major cities, much of the land is unproductive, unaesthetic, and biologically impoverished. Ottawa is no exception. There are also an increasing number of people in these cities who do not have the means to buy healthy food, many of whom would grow their own if they had a space for a garden. Also, with the aging of the population, a growing segment of our communities will have less income but more leisure time and a need for meaningful physical activities. Community gardens offer a win-win solution. They re-connect urban dwellers with nature and help them develop a deeper appreciation of sustainable development. Gardens are also a microcosm of the environment and a portal for understanding concepts and issues in environmental education, both at home and at school. We have established the Brewer Park Community Garden to contribute to food security by transforming a patch of open lawn into rich, fertile soil for growing affordable organic food for the local urban population of Old Ottawa South, including primary school and university students. Members will learn about ecologically responsible gardening practices, such as organic growing methods and water conservation. A group of volunteers will also be growing produce for donation to food banks, meal programs, or other food security programs. One important part of the garden is the children's garden, providing children with access to garden plots where they can grow, harvest, and eat healthy, organic produce. Children and teachers participate in fun gardening activities, see how vegetables and fruits grow, and learn their life cycle and the importance and pleasure of tending the garden regularly. The garden will teach children ecological gardening practices, such as organic growing methods, rainwater harvesting and water conservation, and pollinator-friendly plant varieties. Gardening engages students by providing a dynamic environment to observe, discover, experiment, nurture, and learn. School gardens are living laboratories where interdisciplinary lessons are drawn from life experiences, encouraging students to become active participants in the learning process. The community garden gives city dwellers access to land for growing food while building community ties. It brings together people of all ages and backgrounds to work as volunteers, side-by-side in the garden. It instills community pride by building self-esteem and “greening up” our neighbourhood.